On December 1, 2018, The Sustainers of the Junior League of Summit presented a benefit concert for Keys 2 Success (K2S) at Christ Church in Summit. The performance of Rachmaninoff Variations on a Theme of Corelli, Op. 42 by pianist and K2S founder Jee-Hoon Krska featured The Keys 2 Success Piano Ensemble. The benefit was attended by members and sustainers of the Junior League, families whose children K2S serves, and other supporters of K2S. Keys 2 Success is a not-for-profit organization that provides music education to children in public elementary school and project housing in Newark, New Jersey. K2S is the first children’s music program to target the lowest socio-economic group in Newark, for whom the effects of generations of poverty include lack of access to cultural institutions and social networks that are readily available to children in more privileged communities. K2S seeks to close this gap. Keys was founded in 2016 by Jee-Hoon Krska of New Providence, a Julliard-trained classical pianist, MIT-educated engineer, wife and mother of three who wanted to provide these children with the same opportunities available to her and our children. She believes that music education is a vehicle for kids to tap into their inherent capabilities and develop the discipline, strategies and confidence to thrive not just in music but in academics, social situations and the world, enhancing their lives and the communities in which those lives are lived. Modeled on the El Sistema program, Keys provides individualized training on the piano, coupled with percussion work to strengthen rhythmic skills, and ensemble work to enhance collaborative ability and peer learning skills. Through its faculty and volunteers, K2S teaches piano every day during school hours at a public elementary school and out of school year-round at a public housing project. Starting with Pre-K, students receive lessons multiple days a week.The diverse community of adults, young adults and teenagers drawn from the surrounding communities forms a robust network of coaches and mentors for each student. Since its launch in 2016 with 12 students, K2S has expanded and now teaches 76 children in school and over 100 in the summer program. The program instills discipline, leadership and other life skills, providing pathways to full, productive lives. To learn more about the program, the people, volunteering or donating visit Keys2Success online at keysnewark.com. 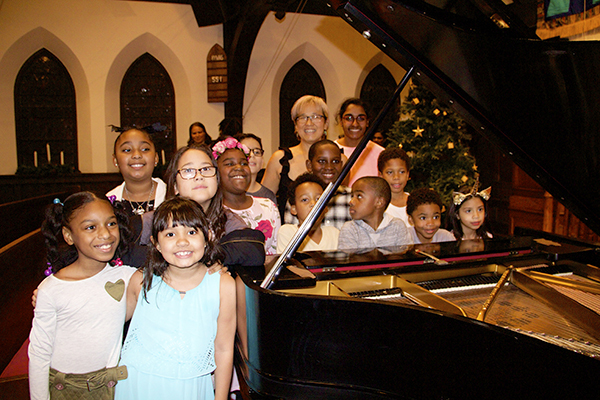 (above) Students from the Keys 2 Success music education program at the benefit concert at Christ Church in Summit.